How many times do your multiple USB gadgets need to charge on a same power strip? How many times are there not enough outlets for the gadgets? Frequently? AViiQ portable charging station should be a nice solution. AViiQ’s portable charging station features a portable, zipped nylon bag. 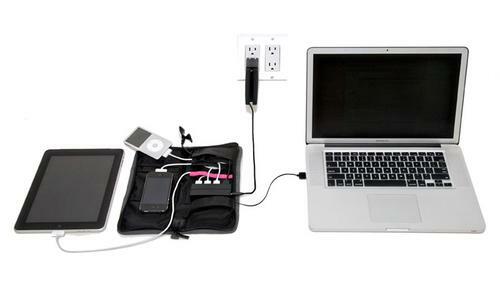 All the other parts of the charging station are organized in the bag for carry easy. 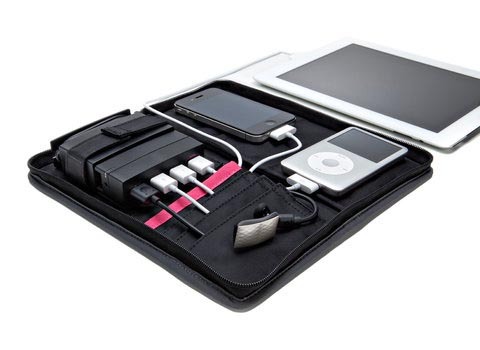 When opening it, you will see the power adapter, 3+1 USB charging hub and well designed compartments in order to double as a cable organizer to manage the tangled cords. The four port hub allies you to charge four USB gadgets at the same time, while the retractable USB port can connect with your computer for data sync. After the break, check out the demo video about the charging station. AViiQ portable charging station is priced at $79.99 USD. If you’re interested, jump to AViiQ official site for more details. Additionally, if you need more options, you might lime to check Zip Multi-Device charging station, iB969 charging station and more via “charging station” tag.